It’s all about the frosting! Don’t you agree?! I usually judge a cupcake based on the frosting. If the frosting is not yummy, it doesn’t matter how moist and delicious the cake part is. This past week was my husband’s birthday and I wanted to make some cupcakes for the party I was throwing him. 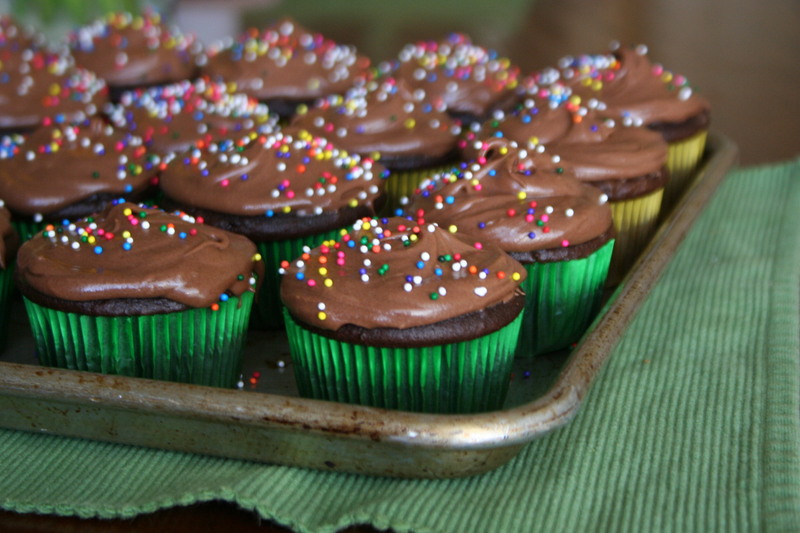 That said … I have yet to find a frosting that I like as much as one that is homemade. I thought about a ganache or a buttercream … then my daughter mentioned how much she loves my classic Cream Cheese Frosting (click here for the recipe). That got me thinking … how could I make that yummy icing chocolate? Well, it’s simple! Just add cocoa powder! The tang of the cream cheese was a perfect compliment to the richness of the cocoa powder. It made for a super chocolatey frosting that was delicious on the Devil’s Food cake. And as the biggest plus of all … this frosting is sooooo simple to make! In the bowl of an electric mixer fitted with the paddle attachment, beat the cream cheese, butter, and vanilla until light and fluffy. Add the sugar and beat until smooth. Add the cocoa powder and beat until smooth and evenly incorporated. Enough for 2 dozen cupcakes or 1 cake. There is no better comfort food than warm melted cheese oozing between two slices of crisp buttered bread…that is unless you make it ultra-indulgent by using pimento cheese! To make the pimento cheese: In a large mixing bowl stir together the cream cheese, mayonnaise, and sugar until smooth. Add the cheddar cheese, red peppers, and the jalapenos. Stir, mashing with a fork, until well combined and relatively smooth. Season with salt and pepper to taste. Add a dash of the hot sauce if desired. Cover and refrigerate until ready to use. To assemble the sandwich: Evenly butter one side of each slice of bread. Place 4 slices, buttered side down, on a work surface. On each slice, evenly spread 1/2 cup of the pimento cheese. Top each sandwich half with 1 of the remaining buttered slices of bread, buttered side up. Preheat a griddle (or a large skillet) over medium heat. Place the sandwiches on the warm griddle and cook until the bottom is golden brown, about 4 minutes. Using a flat spatula, carefully turn the sandwiches over. Cook until the second side is golden brown, about 4 minutes. 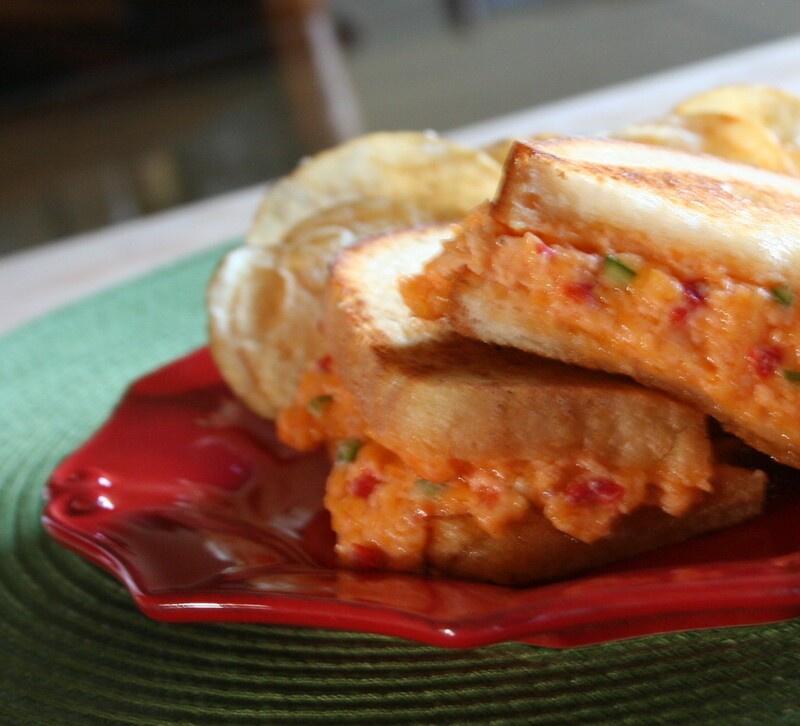 Cooking Tip: I prefer the texture of the pimento cheese better when I grate the cheddar cheese myself. But if you are in a hurry, you can use packaged grated cheese. Back-to-the-Basics: I love the kick that the jalapenos give to this pimento cheese. But if you prefer a milder version, omit the jalapenos. I have to admit … as un-American as it may be … I do not like Pumpkin Pie. Never have …. never will. I have tried everyone’s Grandmother’s “famous” recipe, had it at fancy restaurants … I just don’t like a traditional pumpkin pie. So my dislike of pumpkin pie has nothing to do with pumpkin. I actually really like the flavor of this winter squash. I like it in soups, risottos, slow roasted, and in other baked goods like pumpkin spice muffins and pumpkin chocolate chip cookies. I think it’s the texture of a traditional pumpkin pie that gets me. Especially since I have the same sentiments about sweet potato pie – another veggie I’ll eat any other way. So I went on a quest to find an alternative for my Holiday table. I remembered a delicious cheesecake version that I had at a restaurant, so I tried to duplicate it at home. And luckily … it was a home run! Most cheesecakes use graham crackers for their crusts. Which to be honest I find kinda boring. I usually add nuts to the mixture or find another cookie to crumble. In this case, I found that sharp flavor of Ginger Snaps to be the perfect contrast to the sweetness of the cheesecake. You can make homemade Ginger Snaps but my attitude is why bother since the store bought ones work just as fine. Another time saver is to use canned pumpkin versus fresh. To be honest, I actually prefer it not just for the ease but also because canned pumpkin has a smoother, less stringy consistency that is perfect for this cake filling. Finely grind the ginger snaps in a food processor. Slowly add the butter and blend until it forms moist clumps. Press the crust into the bottom of a 9-inch spring form pan. Bake until set, about 8 minutes. Cool on a wire rack while preparing the filling. In the bowl of an electric mixer, beat the cream cheese, sugar and salt until light and fluffy. Add the eggs 1 at a time and mix well. Add the ginger, cinnamon, and pumpkin puree. Decrease to low speed and stir in the mascarpone until well combined. Evenly spoon the filling into the crust. When the cake is done, loosen it from the edges of the pan by running a knife around the inside edge. Let the cake cool for 30 minutes at room temperature. (Both these steps help prevent the top from cracking.) 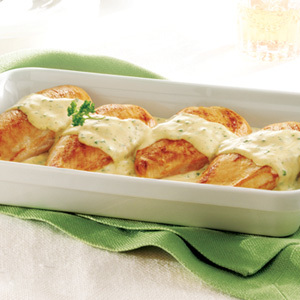 Refrigerate, in the spring form pan, for at least 4 hours. Unmold the cheesecake by running a knife around the inside edge of the pan. 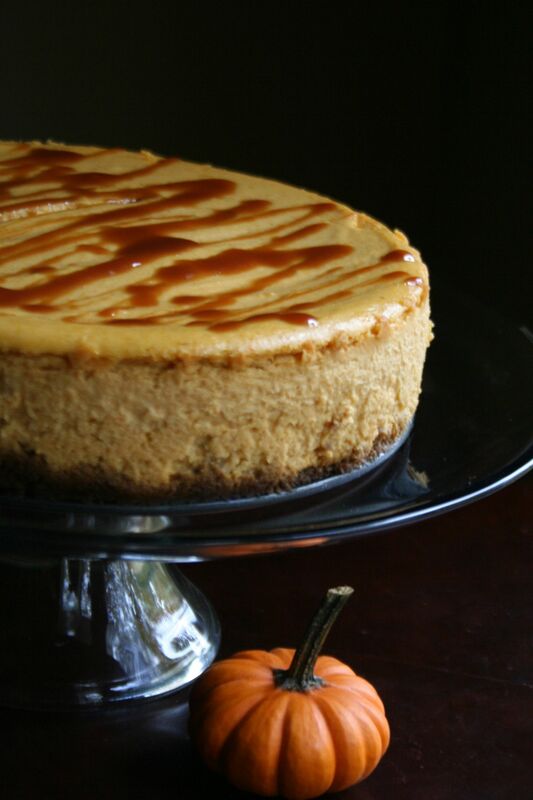 Drizzle the top of the cheesecake with the caramel sauce. This is my go-to frosting. It’s simple, easy, versatile and super tasty. For years I struggled with the perfect frosting. The “American” buttercream made with Crisco shortening is great for decorating cakes , but it’s not my favorite when it comes to taste. Traditional French buttercream has a wonderful flavor, but it is difficult to make. Plus, living in the South, I found that if it was too hot or too humid (like it is 90% of the time in Memphis), I found that my buttercream would easily melt if not refrigerated. Then one day I came across a recipe for cream cheese icing. The cream cheese adds great flavor … and more importantly adds the perfect creamy yet fluffy texture that is a pre-requisite for a good frosting. Cream cheese is also less temperamental than butter, so gone are more worries about wilting frosting if the weather was less than perfect. Cream cheese icing is also the perfect topping for so many cake flavors. 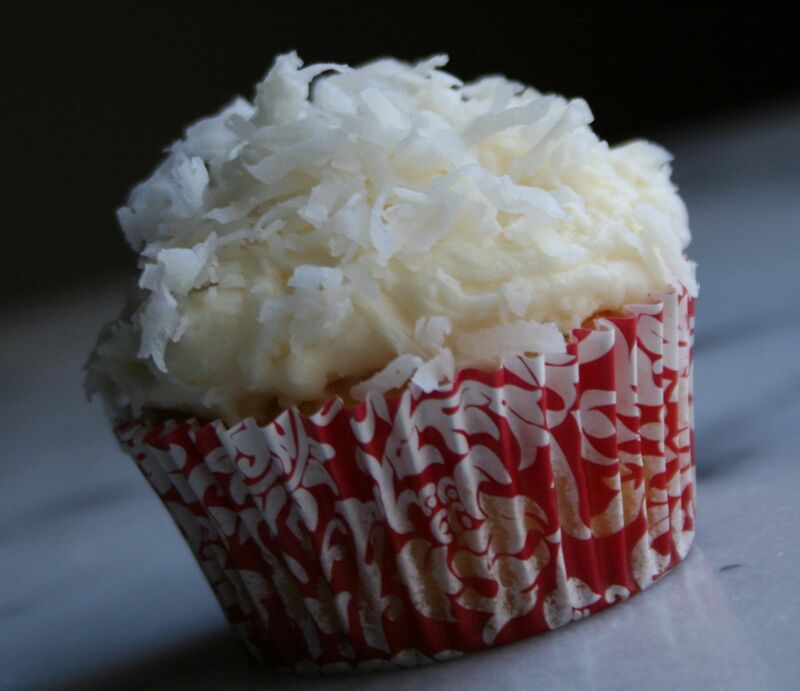 I often use it on coconut cupcakes as in the picture above. But it is equally delicious on a chocolate cake or red velvet cake. (Sometimes when I make chocolate cupcakes I sprinkle chocolate chips or chocolate jimmies on top to add a little pizzazz to my presentation.) Add a little lemon zest or lemon extract for the perfect topping to a lemon cake. Or slather your next carrot cake with this yummy frosting. So get baking and top those cakes with this fool-proof Cream Cheese Frosting! In the bowl of an electric mixer fitted with the paddle attachment, beat the cream cheese, butter, and vanilla until light and fluffy. Add the sugar and beat until smooth.